*This post is sponsored by General Mills and Yoplait Greek 100 Whips! 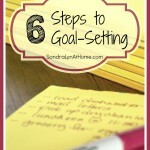 As always, the content, recipe and opinions expressed here are my own!! 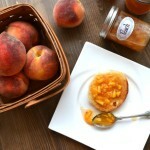 Is there one fruit that screams ‘summer’ to you? OK, I know it’s just barely spring, but we’re dreaming of summer, right? The fruit that says ‘summer’ to me is the strawberry. That single red berry has the power to conjure up treasured childhood memories of strawberry pies and homemade ice cream. The fruit itself is one of the best antioxidants around, and contains quite a healthy dose of vitamin C.
Mini Strawberry Cheesecakes with Yoplait Whips! Its succulent taste is what makes the strawberry irresistible to most of us. For these Mini Strawberry Cheesecakes, I wanted to use my favorite fruit, as well as the new Yoplait Greek 100 Whips! from Publix. And you want to hear something funny? 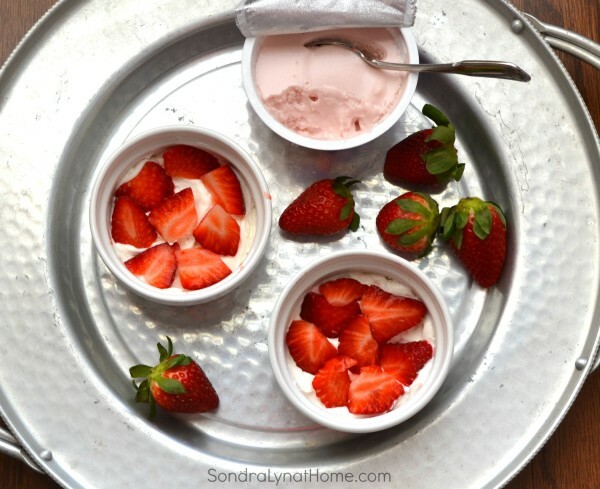 I used to mix whipped topping with yogurt in order to get a yummy ‘whipped’ consistency! Now there is Yoplait Whips! and I can buy yogurt that tastes like whipped mousse. All the flavors are soooo good – and only 100 calories. With flavors like Black Cherry, Blueberry, Strawberry and Vanilla Cupcake it’s easy to indulge without the guilt. If you want a slightly more substantial dessert, here is one delicious concoction combining Yoplait Whips! with low-fat cream cheese and strawberries. And it’s still relatively low in calories. As a crust, I pulverized one pack of 2- oats and honey granola bars. I divided the crumbs among 2 dessert dishes, reserving about 1 T for garnish. Then I whipped together 2 ounces of 1/3 less fat cream cheese (Neuchâtel) with 1 tablespoon sugar substitute and layered on top of the crumbs. Mmmm… it was just what my sweet tooth ordered: that delectable mousse texture and strawberry taste with just the right amount of granola crunch! 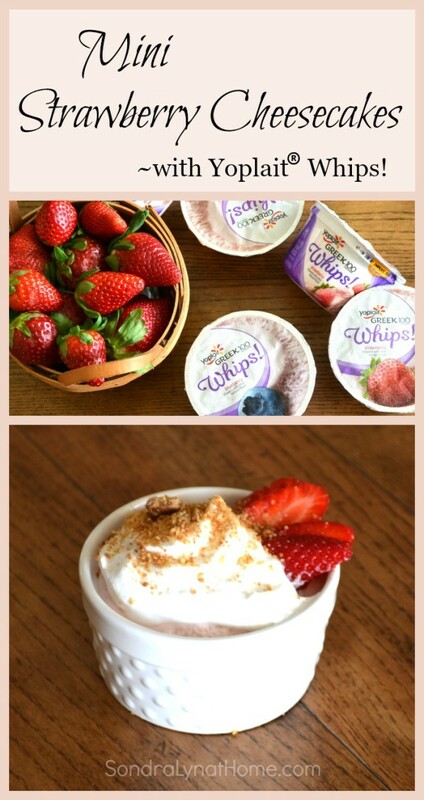 Here’s a pic to Pin… and scroll on down for the printable recipe as well as a link for a coupon to try Yoplait Whips! AND there’s more! 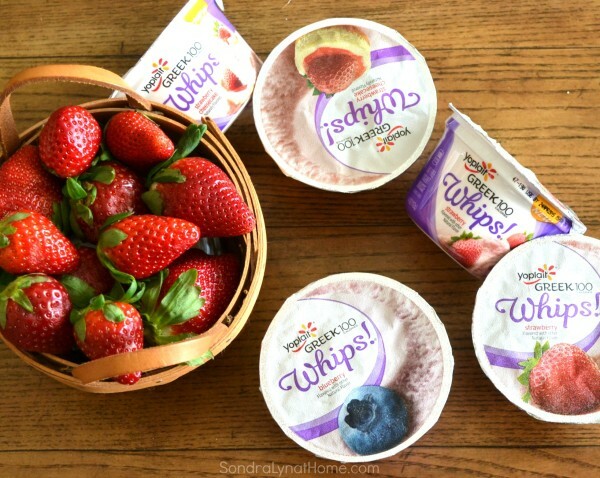 A giveaway to win $15 toward your purchase of the new Yoplait Greek 100 Whips! 2 containers Strawberry Yoplait Greek 100 Whips! Pulverize granola bars in mini food processor. 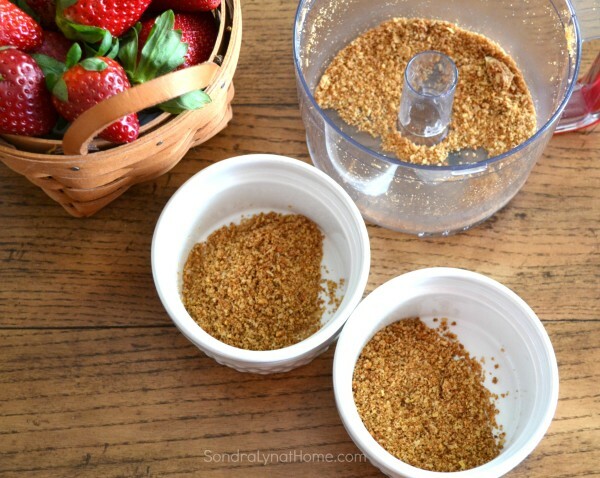 Divide crumbs equally into two small serving bowls, reserving about 1 T crumbs. Whip softened cream cheese with sugar substitute in mixing bowl and drop by spoonfuls on top of crumbs. Slice a couple of berries on top of cream cheese layer, reserving 2 berries for garnish. Top with a dollop of whipped topping, remaining crumbs and 1 strawberry each. Now, make sure you click HERE for your coupon to try new Yoplait Greek 100 Whips! You’ll have to sign in or register for Publix Online digital coupons, but it’s easy and free… plus it brings you all the weekly and monthly coupons from Publix. 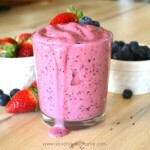 I hope you enjoy this recipe and I know you’re going to love new Yoplait Whips! I would like to try strawberry cheesecake. I’d like to try the strawberry cheesecake flavor. Thanks for the giveaway! The blueberry Whips look great to me! I’m all for the Strawberry flavor. I would love to try the Strawberry. I love Strawberry yogurt. Mmm yum! I’ve always liked flavored yogurt but this makes me want some right now! Thanks for sharing! 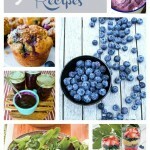 Oh I would love to try the Blueberry! Although they all sound so good! I’d Like To Try The Strawberry Flavor. Id like to try strawberry! This look so delicious! Such a healthy and fabulous snack. I would try the raspberry flavor. I think the strawberry is for me. Blueberry is my favorite with other yogurts so I’d like to try that. Strawberry for me, too, please! That strawberry cheesecake flavor is calling my name! i have to go with the strawberry kind. sounds great. 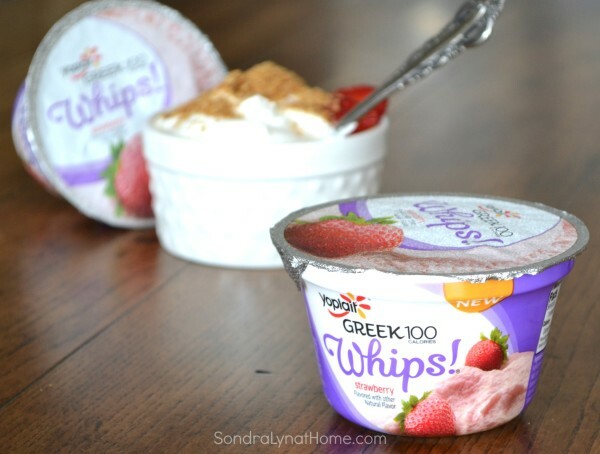 I would love to try the Vanilla Cupcake flavor of the Yoplait Greek Whips. I’ve never had vanilla cupcake so I’d have to try that first. I would like to try the Strawberry flavor for myself and the blueberry flavor for my husband. I would like to try the blueberry first. After that I would like to try strawberry. I would try the strawberry flavor. I would like to try the bluberry. They all sound good, but I’d definitely try the strawberry. I would try the Raspberry first. I to try the strawberry flavor since that’s my favorite fruit and yogurt flavor! The Strawberry Cheesecake one sounds delicious. Thank You for the giveaway…we want to try the black cherry !